In early times, peas were grown mostly for their dry seeds. From plants growing wild in the Mediterranean basin, constant selection since the Neolithic dawn of agriculture improved their yield. In the early 3rd century BC Theophrastus mentions peas among the pulses that are sown late in the winter because of their tenderness. In the first century AD Columella mentions them in De re rustica, when Roman legionaries still gathered wild peas from the sandy soils of Numidia and Judea to supplement their rations. among the street cries of Paris. Green "garden" peas, eaten immature and fresh, were an innovative luxury of Early Modern Europe. In England, the distinction between "field peas" and "garden peas" dates from the early 17th century: John Gerard and John Parkinson both mention garden peas. 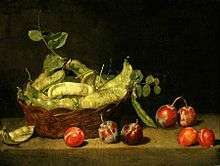 Sugar peas, which the French soon called mange-tout, for they were consumed pods and all, were introduced to France from the market gardens of Holland in the time of Henri IV, through the French ambassador. Green peas were introduced from Genoa to the court of Louis XIV of France in January 1660, with some staged fanfare; a hamper of them were presented before the King, and then were shelled by the Sovoyan comte de Soissons, who had married a niece of Cardinal Mazarin; little dishes of peas were then presented to the King, the Queen, Cardinal Mazarin and Monsieur, the king's brother. Immediately established and grown for earliness warmed with manure and protected under glass, they were still a luxurious delicacy in 1696, when Mme de Maintenon and Mme de Sevigné each reported that they were "a fashion, a fury." In modern times peas are usually boiled or steamed, which breaks down the cell walls and makes the taste sweeter and the nutrients more bioavailable. Along with broad beans and lentils, these formed an important part of the diet of most people in the Middle East, North Africa and Europe during the Middle Ages. By the 17th and 18th centuries, it had become popular to eat peas "green", that is, while they are immature and right after they are picked. New cultivars of peas were developed by the English during this time, which became known as "garden" or "English" peas. The popularity of green peas spread to North America. 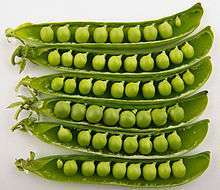 Thomas Jefferson grew more than 30 cultivars of peas on his estate. With the invention of canning and freezing of foods, green peas became available year-round, and not just in the spring as before. Fresh peas are often eaten boiled and flavored with butter and/or spearmint as a side dish vegetable. Salt and pepper are also commonly added to peas when served. 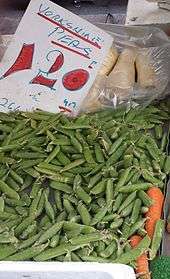 Fresh peas are also used in pot pies, salads and casseroles. Pod peas (particularly sweet cultivars called mange tout and "sugar peas", or the flatter "snow peas," called hé lán dòu, 荷兰豆 in Chinese) are used in stir-fried dishes, particularly those in American Chinese cuisine. Pea pods do not keep well once picked, and if not used quickly, are best preserved by drying, canning or freezing within a few hours of harvest. In India, fresh peas are used in various dishes such as aloo matar (curried potatoes with peas) or matar paneer (paneer cheese with peas), though they can be substituted with frozen peas as well. Peas are also eaten raw, as they are sweet when fresh off the bush. Split peas are also used to make dhal, particularly in Guyana, and Trinidad, where there is a significant population of Indians. Dried peas are often made into a soup or simply eaten on their own. In Japan, China, Taiwan and some Southeast Asian countries, including Thailand, the Philippines and Malaysia, peas are roasted and salted, and eaten as snacks. In the Philippines, peas, while still in their pods, are a common ingredient in viands and pansit. In the UK, dried yellow split peas are used to make pease pudding (or "pease porridge"), a traditional dish. In North America, a similarly traditional dish is split pea soup. In Chinese cuisine, the tender new growth [leaves and stem] (豆苗; dòu miáo) are commonly used in stir-fries. Much like picking the leaves for tea, the farmers pick the tips off of the pea plant. In the United Kingdom, dried, rehydrated and mashed marrowfat peas, known by the public as mushy peas, are popular, originally in the north of England, but now ubiquitously, and especially as an accompaniment to fish and chips or meat pies, particularly in fish and chip shops. Sodium bicarbonate is sometimes added to soften the peas. In 2005, a poll of 2,000 people revealed the pea to be Britain's seventh favourite culinary vegetable. There are many varieties (cultivars) of garden peas. Some of the most common varieties are listed here. PMR indicates some degree of powdery mildew resistance; afila types, also called semi-leafless, have clusters of tendrils instead of leaves. Unless otherwise noted these are so called dwarf varieties which grow to an average height of about 1m. Extra dwarf are suitable for container growing, reaching only about 25 cm. Semi-tall reaches about 1.5m and tall grows to about 2m. Pisum sativum var. macrocarpon is commonly known as the snow pea. This arrangement means that the root nodules are sources of nitrogen for peas and many legumes, making them relatively rich in plant proteins. All proteins contain nitrogenous amino acids. Nitrogen is therefore a necessary ingredient in the production of proteins. Hence, peas and many legumes are among the best sources of plant protein. When a pea plant dies in the field, for example following the harvest, all of its remaining nitrogen, incorporated into amino acids inside the remaining plant parts, is released back into the soil. In the soil, the amino acids are converted to nitrate (NO3−), making the nitrogen available to other plants, thereby serving as fertilizer for future crops. Bioplastics can be made using pea starch. The name marrowfat pea for mature dried peas is recorded by the Oxford English Dictionary as early as 1733. The fact that an export cultivar popular in Japan is called Maro has led some people to assume mistakenly that the English name marrowfat is derived from Japanese. The annual 'Peasenhall Pea Festival' in the English village of Peasenhall, Suffolk attracts hundreds of visitors every year, with events such as Pea Shooting, the World Pea Podding Championships and National Pea Eating competition. In 2012, the Pea Festival had an OlymPEAn theme, celebrating the London 2012 Olympics. ↑ "The Plant List: A Working List of All Plant Species". Retrieved 7 March 2015. ↑ "Dry Field Pea". purdue.edu. ↑ Maguelonne Toussaint-Samat, A History of Food, 2nd ed. 2009:38ff. 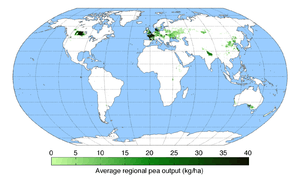 ↑ Peas have been found in the Neolithic site of Abeurador in the south of France (Toussaint-Samat). ↑ Theophrastus, Historia Plantarum, VIII.i.4. ↑ Edict quoted in Michel Pitrat and Claude Four, Histoires de légumes: Des origines à l'orée du XXIe siècle, "Le pois au cours des siècles" :353. ↑ An account is in Toussaint-Samat. ↑ Quoted by Michel Pitrat and Claude Four. ↑ "Product how-to guides". PCC Natural Markets. ↑ Wainwright, Martin (2005-05-23). "Onions come top for British palates". The Guardian. London. ↑ Vrabel, Jeff (2016-07-10). "If You Like Almond Milk, You'll Love...Pea Milk?". Retrieved 2016-07-13. ↑ "How frozen vegetable is made - production process, making, used, processing, product, industry, machine". madehow.com. ↑ "Nutrition Facts: Peas". Nutrition. vegonline.org. Retrieved February 28, 2015. ↑ Jegtvig, Shereen (July 17, 2007). "Peas". Nutrition. About.com. Retrieved 2011-01-28. ↑ Pownall TL, Udenigwe CC, Aluko RE (2010). 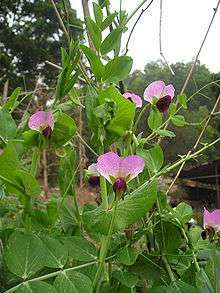 "Amino acid composition and antioxidant properties of pea seed ( Pisum sativum L.) enzymatic protein hydrolysate fractions". Journal of Agricultural and Food Chemistry. 58 (8): 4712–4718. doi:10.1021/jf904456r. PMID 20359226. ↑ "Peas-Western Oregon, Commercial Vegetable Production Guides". Oregon State University. ↑ Watson, Terumi. 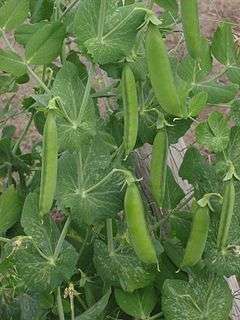 "UT Garden's Plant of the Month - Tom Thumb Pea". University of Tennessee. Retrieved February 28, 2015. ↑ "Vegetable Cultivar Descriptions for North America". ↑ Kelvedon Wonder is popular in the United Kingdom, but uncommon elsewhere. ↑ "Recruit Peas". Pure Line Seeds. Retrieved February 28, 2015. ↑ Hagedorn, D. J. (1976). Handbook of pea diseases (PDF). University of Wisconsin - Extension. ↑ Hagedorn, Donald J. (1974). Virus Diseases of Pea, Pisum sativum. St. Paul, Minnesota: American Phytopathological Society. p. 7. ↑ Barkley, Shelley (2007-05-02). "Pea Leaf Weevil". Agriculture and Rural Development website. Government of Alberta. Retrieved 2009-04-05. ↑ "Gregor Mendel: The Pea Plant Experiment". juliantrubin.com. ↑ The Garden Pea Retrieved 14 April 2012. ↑ Pitman, Sean D. The Father of Genetics May 2002. Retrieved 14 April 2012. ↑ Sanchez-Monge, R.; G. Lopez-Torrejon; C. Y. Pascual; J. Varela; M. Martin-Esteban; G. Salcedo (2004). "Vicilin and convicilin are potential major allergens from pea". Clinical & Experimental Allergy. 34 (11): 1747–1753. doi:10.1111/j.1365-2222.2004.02085.x. ISSN 0954-7894. ↑ "Glucose-6-Phosphate Dehydrogenase Deficiency". TheFreeDictionary.com. ↑ "favism - genetic disorder". Encyclopedia Britannica. European Association for Grain Legume Research (AEP). Pea. http://web.archive.org/web/20061017214408/http://www.grainlegumes.com:80/default.asp?id_biblio=52 .